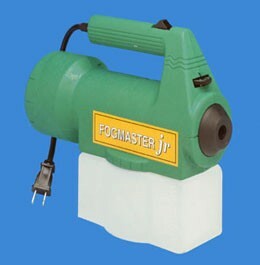 PRODUCT DESCRIPTION: Electric fogging machine which can handle both water and oil based formulations. The machine converts liquid formulations to a fine mist. This mist is then directed over an air space where mosquitoes, gnats and other pests are active. The mist or fog will quickly kill flying pests. This unit has a dial which enables you to keep set the flow rate to low, medium or high. There is also an on/off switch and a quart holding tank (32 liquid ounces) for the solution you want to apply. 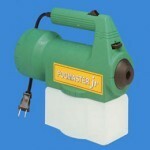 Flow rate is about 3 oz per minute max and the particle size will range from 15-40 microns.